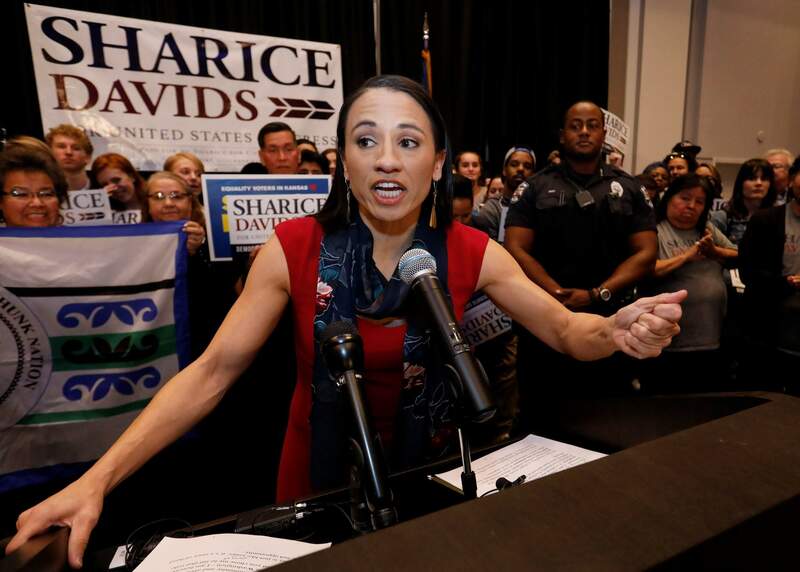 Democrat Sharice Davids speaks to supporters at a victory party in Olathe, Kan., on Tuesday after she won a seat on the U.S. House of Representatives. 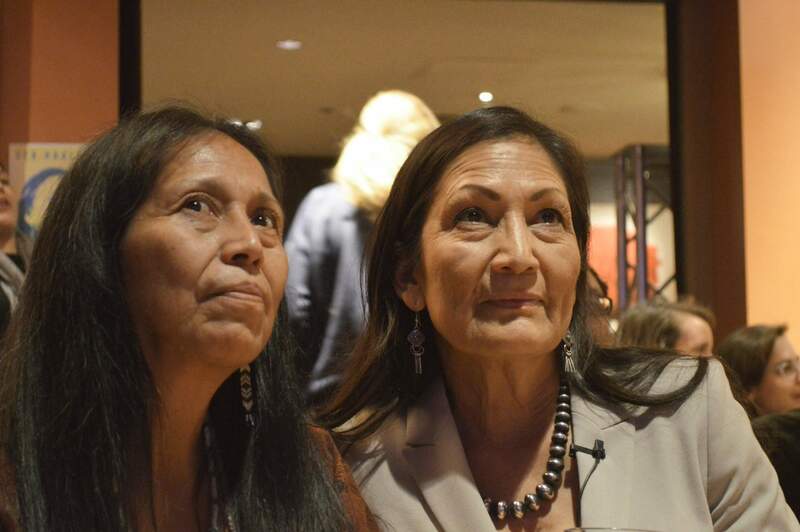 Congresswoman-elect Deb Haaland, right, watches election returns with Beth Touchin, the Native American Outreach Director of the Democratic Party of New Mexico in Albuquerque on Tuesday. ALBUQUERQUE – As a girl, Debra Haaland remembers joining her grandmother as she chopped wood and fetched water for her home in tiny Mesita, a Native American community situated in New Mexico’s high desert. Haaland, an enrolled Laguna Pueblo member, is certain it was these early experiences and the example of her grandmother’s work ethic that helped her win a seat in the U.S. House Representatives on Tuesday – a political victory that until this year had been beyond reach for numerous Native American women. Her fellow Democrat Sharice Davids, who is Ho-Chunk, also won her historic bid to represent a U.S. House district in Kansas. Their wins add them to a record number of women elected to the U.S. House on Tuesday following an election cycle that also saw a significant boost in Native American female candidates at the state and local level. In an interview, Haaland, a former New Mexico Democratic Party chairwoman, credited a vast political network she built after nearly 20 years of working on other candidates’ campaigns, her team and volunteers, and her own hard work. Davids’ district, meanwhile, lies in the suburbs west of Kansas City. She unseated U.S. Rep. Kevin Yoder, a Republican. In addition to being one of the first Native American congresswomen, she’ll also be the nation’s first LGBT Native American to serve as a federal lawmaker. She recalled donating to the 1992 congressional campaign of Ada Deer, a Menominee woman who ran as a Democrat for a seat in Wisconsin. Twelve years later, Free herself ran for Congress in Oklahoma and then founded INDN’s List, a political organization that sought to recruit and build support for Native American candidates. Haaland raised about $1.9 million, more than any of her opponents, despite hearing of doubts from other Democrats early in the race that she wouldn’t be able to compete financially, she said. She cleared a crowded primary field before handily defeating former state lawmaker Janice Arnold-Jones, a Republican, in Tuesday’s election. Haaland said her fundraising push included visits to tribes’ administration buildings throughout the country, where she said she discussed a range of issues with tribal leaders.